No matter what app industry vertical you function in, it is critical for all app developers and mobile marketers – like you – to understand your target users’ journeys. This blog discusses the critical aspects involving App Awareness and User Acquisition and is the first in a series of five that focuses on each of the broad stages across the App User Lifecycle Journey with regards to the travel sector. 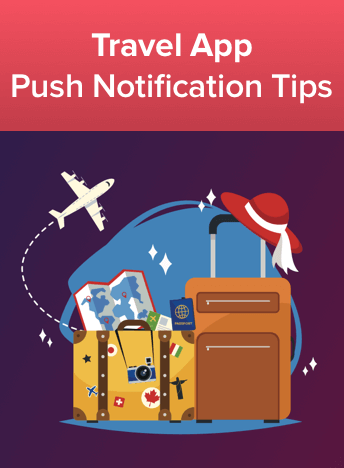 Why should Travel Apps even Care about App Awareness and User Acquisition? The online travel sector has emerged as a leading driver of growth in the overall travel industry; touted to be worth USD 1,091 billion by 2022 at a CAGR of 11.1%. With a plethora of mobile apps at the disposal of more well-informed users; mobile travel service bookings as a share of total global online bookings have skyrocketed by over 230% between 2015 and 2016 alone. As of 2016, revenues worth USD 65 billion were generated through mobile app bookings – globally – in comparison to the USD 115 million earned through traditional online bookings. This number is only likely to increase in the future as the share of mobile app bookings in the overall revenue pie continues to rise. 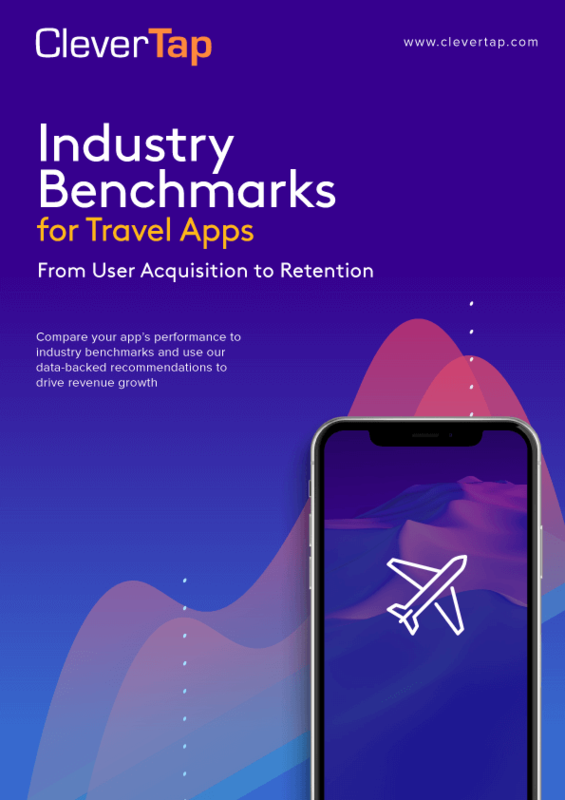 With over 5% of all apps available across both Android and iOS platforms being travel-centric apps; it creates a highly competitive marketplace. Rising above the clutter to attract and engage users is one of the biggest challenges you will face today. This is precisely why app awareness and subsequent user acquisition is of paramount significance. Let me shed light on the 4 key strategies that you can adopt to power up app awareness and user acquisition for your travel app…like never before! Measure how your app is performing against the best in the industry and benefit from our data-driven recommendations to drive growth and revenues. Creating enough buzz around your app to drive app downloads is a major stepping stone to success. And, one of the best ways of doing so is through App Store Optimization (ASO). It’s the process of optimizing your app store presence. Higher your search ranking, greater the chances of getting your app featured – higher your app visibility; thus, increasing the chances of app downloads. ASO assumes even greater significance for travel apps, given how dependent on user search action this segment remains. Main Title: Include keywords that have high search volume specific to the travel industry; such as: travel, trip, flights, trains, hotels, vacations, etc. In the beginning, it is acceptable to play around with your title as you attempt to hit upon what works best for your app. But, as your app continues to gain traction on the app rankings; you would benefit by locking in a permanent title as too much chopping and changing can erode carefully built brand recall. Ensure you pick something unique that doesn’t get lost in the crowd. Also, avoid using too many irrelevant keywords in your title as app stores often suspend apps for “keyword stuffing”. So don’t pad your title with random keywords. Try to find a mix that capitalizes on search and positions your app as best in class. Number of App Downloads: There is only so much that you can control when it comes to identifying and bidding for relevant keywords. Beyond that, app discovery and download depend on user discretion. App Ranking: This is greatly influenced by the number of downloads. More downloads, the greater your chances of a potential user giving your app a try. App Ratings and Reviews: Rankings and reviews have an enormous impact on your app’s visibility — and propensity for new users to download. This is especially true if your brand is relatively unknown in the market. Apart from providing an excellent user experience, there are a couple of things you can do to get more of those coveted 5-star reviews. For one – ask! Use in-app notifications to find out which users are happy with the app, and ask them to leave a review. Or, you could offer discounts or access to exclusive content in exchange for ratings and reviews. 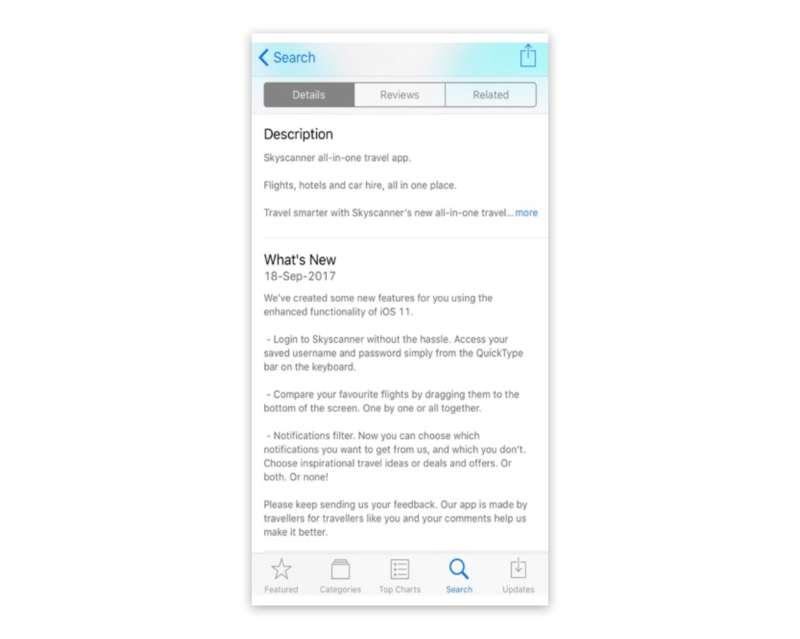 App Description: Include a brief, well-written description of the app’s main features and benefits; along with engaging screenshots or short videos of the app. You should also include the version and date of last update, as they have a bearing on eventual user acquisition. Users are more likely to download a travel app that clearly communicates its benefits and version updates. Think of this as subtle user engagement. 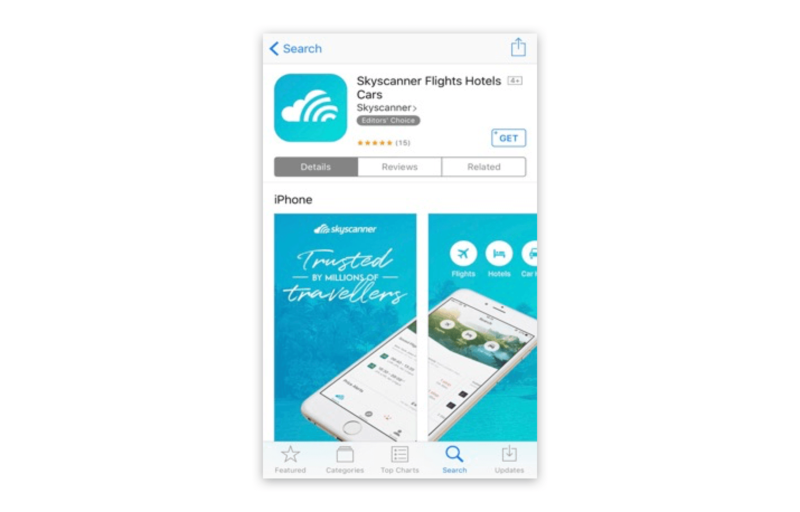 UK-based travel app Skyscanner is an excellent example of smart ASO. Only 40% of users search for apps in the app store. This means 60% make travel-specific searches on desktop or mobile web browsers. That’s why app indexing is so critical to app awareness and user acquisition. Simply put, Android and iOS algorithms recognize HTTP URLs and establish connections between your app’s website, app store page and/or the app itself. 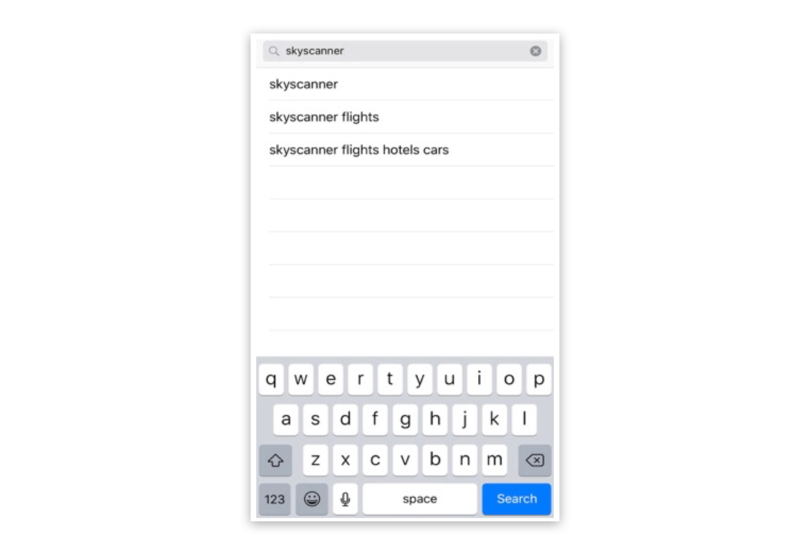 Adding deep links to your app means a simple travel-specific search will display your app as a search result, directing interested users to your app store page. Not only does this increase app discoverability, it also helps you re-engage existing users by directing them to the app on their device. 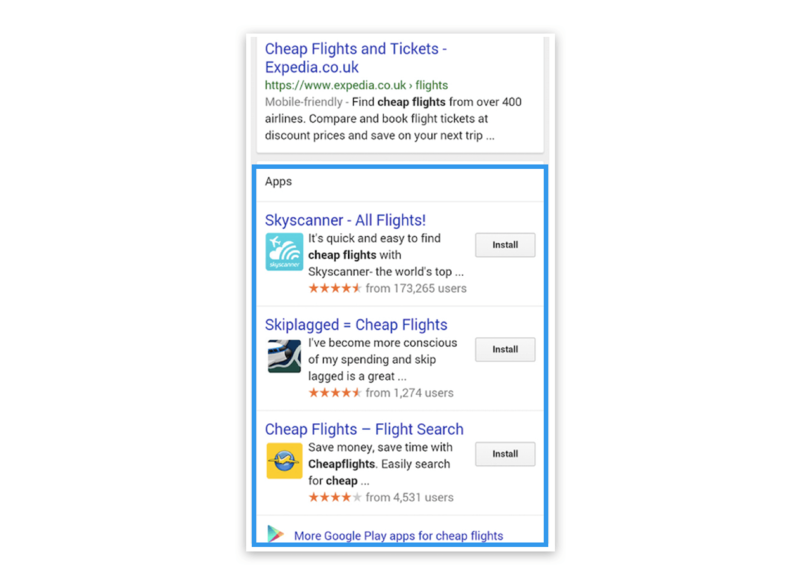 Hop on this bandwagon, if you haven’t already as 40% of searches now return app indexing results in the top five results! After spending extensively on conceptualising, developing, testing and launching a comprehensive travel app; the only way you can achieve a respectable return on investment is by diverting your existing user base from your website to your app. With conversions on mobile travel platforms rising to 88%, your app becomes even more important to your business. Directing web visitors to your app can be as simple as adding a “Download the App” button or page to your website. Encourage existing customers to download the app with incentives. Offer loyalty points or a discount on their first in-app purchase. Travel giant Expedia does an excellent job of this. They ask web users to enter their mobile numbers, and then send a direct link to download the app. 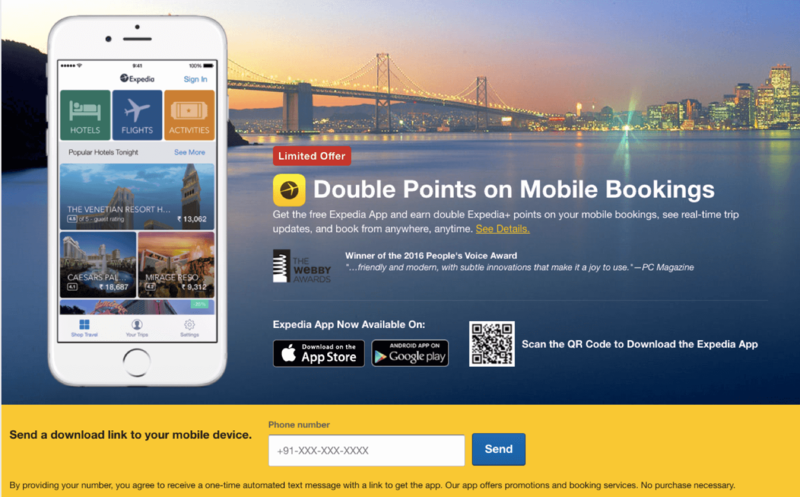 Now Expedia has a personal touchpoint to send their latest offers, as well as a way to drive users to their app. If you already have a list of contacts who are interested in your product, use it! Send a drip campaign encouraging existing users to try your travel app, along with an incentive to download. This will help engage users with your app, and communicate your latest offers. A successful campaign of this nature backed by a growing band of satisfied users is likely to result in positive word-of-mouth; that will further add to app visibility and discoverability. Get a more detailed outlook on how to further drive user engagement and long-term retention for your travel app. When users are potentially involved with your travel app; they engage in different activities and throw up various events at multiple stages of the app user lifecycle journey. Now you have several key strategies for improving user awareness and acquisition. But how will you know if they’re working? Improving app awareness and discoverability will immediately distinguish your app from the competition — and set you up for guaranteed long-term success. As with everything; there is always more to user engagement than meets the eye. Stay tuned for my next post on optimizing the User Onboarding process as we “travel” along the app user lifecycle journey.